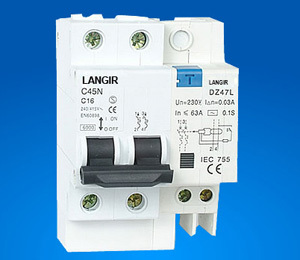 DZ47L-63E residual current circuit breaker simply fits onto the right hand side of any DZ47 miniature circuit breaker which forms DZ47LE to provide a high level of protection against earth leakage fauls in addition to the overload and over current protection by the MCB alone. Operate part can not be taken down from the shell outer of products , the shell can not influence the operating organization to work , the accessory group which replace the feelers pressure, should guarantee the feelers pressure does not change while running. Circumstance temperature -5°C ~ +40°C, average temperature within 24h not exceeding +35°C. Altitude above sea level less than 2000 m.
Humidity not exceeding 50% at 40°C and not exceeding 90% at 25°C. Installation class II or III. Product shall be installed at the place where there shall be no severe impact and vibration. Product shall be vertically mounted onto standard Din rail 35mm.